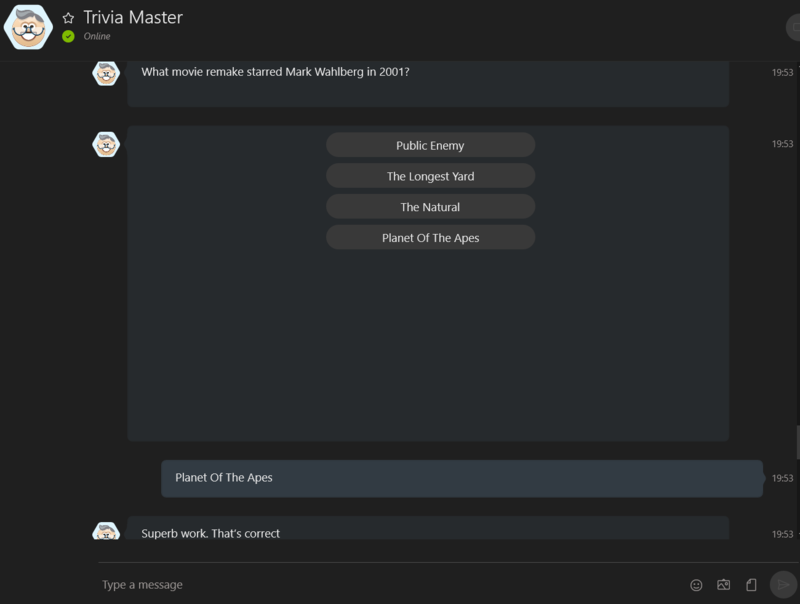 Skype Preview, now with Skype Bots! As part of the recent Windows 10 Anniversary update, Skype was updated to Skype Preview. 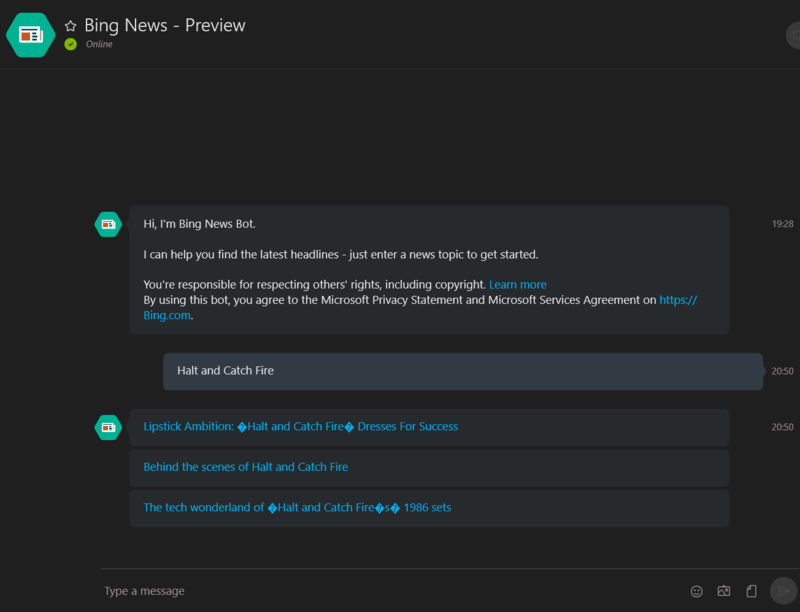 Part of the preview is the new Skype Bots system. Bots are the new Apps, which are the new Websites, or something… Everyone is doing Bots these days. These early bots are about what you might expect, simple interactions that may or may not be useful. I did some testing with some of the bots. There is also an If This Then That Bot, which I’m not going into detail on here. I think it would be better served with it’s own separate write up. Gene Wilder, because he passed away today. It’s possibly the biggest story of the day. I got 3 stories returned, all about his passing. Pana, IL, because it’s where I live. We don’t get a lot of news around here relating to the town, but it did return a story that was in the news recently. As well as a couple of others that were more just “area news”. Taylor Swift, because she’s in the gossipy news a lot. I received three stories about her reporting for Jury Duty. This topic and the Gene Wilder results kind of give an idea of the sameness problem. I don’t really need the same story three times. There isn’t any obvious sources listed wither so it’s not as if you can choose your preferred source. Clicking a headline is a blind shot for where you’re going. Honestly, I’m not sure how useful this really is. Chances are you’re looking for news on a topic because you already know what the news is, ala Gene Wilder dying. Otherwise, you’ve probably seen it already on some social media. Similar to the News Bot except it returns 3 images. I did a test search for Cats. It doesn’t even return the images, just links to the images. You’d be way better off just going to images.bing.com and getting all the results, in a nice visual grid. Moving on to some of the game bots. Trivia Master is just as it sounds. You tell it to start, it asks ten trivia questions on a topic, then gives a score. The answers are multiple choice, so you don’t have to worry about spelling or exact wording. It’s alright, but kind of a one trick horse that’s old as the hills. The individual scoring flies by too fast as well, meaning you’ll have to keep scrolling back up to see if you were correct or not. This problem is compounded by all of the wasted space in each of the message boxes. It would make for a better party game or maybe some sort of back and forth with another Skype friend. 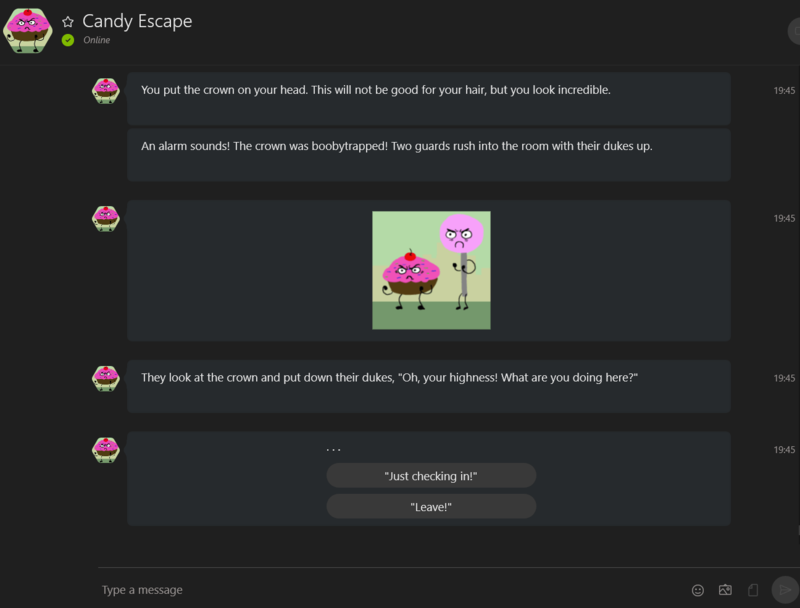 Probably the most complex bot that I tried out was Candy Escape, a game that is reminiscent of the old Interactive Fiction games (ie ZORK). 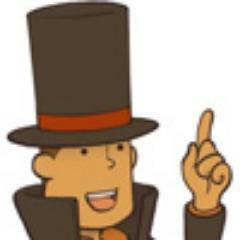 You must solve puzzles and escape the candy prison. You are the Walking Meat imprisoned by Candy. It’s mostly pre-definined choices based, though not entirely. For example, I was asked “What is the password”, which was just typed out with no choices offered. It’s not without it’s quirky bugs though. Early on I retrieved a rope from a skeleton after examining it. Later, upon a second examination, the rope was gone from the image shown, but there was still an option to take it. I also seemed to get stuck in a loop and the game’s hint wasn’t helpful at all. I needed to escape from two guards, but my only option was to tell them to leave, which they refused to do, or to remove the crown, which just gave me the option to put the crown back on during my next choice, which brought me back where I started.